I do not shoot with my hand, I shoot with my mind. I do not kill with my gun, I kill with my heart. If you could see your whole life laid out in front of you, would you change things? Is “Rush Hour 4” Happening? 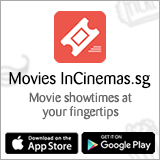 3 Films at the Singapore Chinese Film Festival you have to watch!